Marco Zuccarini is a native of Milan where he graduated from the CONSERVATORIUM GIUSEPPE VERDI in piano and clarinet. He went on to post-graduate studies at the ACCADEMIA DI SANTA CECILIA, Rome, graduating with honours in chamber music under the guidance of Riccardo Brengola. In 1990 Marco Zuccarini founded the ORCHESTRA DE TEATRO OLIMPICO DI VICENZA, conducting various prestigious events including the recording of the first performance of the contemporary revision of Guluppi’s opera LE NOZZE and the complete Beethoven piano concerti, recorded with Mario Tipo for RADIOTELEVISIONE ITALIANA. 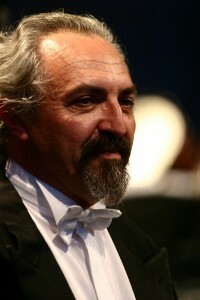 He is actively involved in the performance of contemporary Italian music and in 1996 made a live recording of the first Italian performance of ALLELUJA by Rendine, the work originally written for, and conducted by Ashkenazy at the NOBEL PRIZE ceremony with Milva and the ORCHESTRA SCARLATTI of Naples. In the same year he gave the first Italian performance of Hindemith’s DER DEMON with I POMERIGGI MUSICALI and dancers from LA SCALA, Milan. His most recent commercial release has been the world premiere DVD recording of Paisiello’s opera, LA SERVA PADRONA. He has directed such internationally acclaimed soloists as José Carreras, Salvatore Accardo, Katia Ricciarelli, Cecilia Gasdia, Milva, Astor Piazzola and Benedetto Lupo. His work has met with considerable critical acclaim, LA NUOVO saying, refined, sensitive, delicately expressed… guided by the precise baton of Zuccarini. In 1998 Marco Zuccarini made his first visit to Australia to conduct the BISHOP ORCHESTRA for the 50th anniversary celebrations of AUSTRALIAN NATIONAL MUSIC CAMP at Mittagong and to conducted the WEST AUSTRALIAN SYMPHONY ORCHESTRA in performances including Mendelssohn’s SYMPHONY NO.4 as part of the program of the FESTIVAL OF PERTH. This began an association with Australia which continues to this day, initially seeing him return during 1999 for SYMPHONY AUSTRALIA to conduct the MELBOURNE SYMPHONY, TASMANIAN SYMPHONY ORCHESTRA, the ADELAIDE SYMPHONY ORCHESTRA and the WEST AUSTRALIAN SYMPHONY ORCHESTRA. Reviewing the performances of the ADELAIDE SYMPHONY, THE ADVERTISER said, Zuccarini conducted an outstandingly conceived and executed guided tour of his homeland’s music…interest and excitement accumulated throughout, culminating in a thrilling finale. …the orchestra was infused with his passion… The WEST AUSTRALIAN said, Every once in a while, the myriad factors that constitute music performance fall so felicitously into place that the result is magical. Marco Zuccarini made his debut, conducting Puccini’s MADAM BUTTERFLY, during 2003, for OPERA AUSTRALIA. During 2005 and 2006 he returned to the TASMANIAN SYMPHONY ORCHESTRA and AUCKLAND PHILHARMONIA ORCHESTRA to conduct such major works as Rachmaninov’s PIANO CONCERTO NO.3 and Mahler’s KINDERTOTENLIEDER and, again in 2006, for ORCHESTRA VICTORIA. Throughout this period his busy international career continued with engagements which included the ORCHESTRA OF CANNES, the LJUBLJANA PHILHARMONIC ORCHESTRA the STATE SYMPHONY ORCHESTRA in Santiago, Chile, the PHILHARMONIA ENESCU in Romania and the ACCADEMIA DELLA SCALA in Milan. 2007 included concerts in Australia with ORCHESTRA VICTORIA and the TASMANIAN SYMPHONY ORCHESTRA and his debut with THE QUEENSLAND ORCHESTRA conducting the winners’ concert of the LEV VLASSENKO PIANO COMPETITION. During 2008 Marco Zuccarini made his debut with the ACCADEMIA NAZIONALE DE SANTA CECILIA in Rome and with the NATIONAL SYMPHONY ORCHESTRA of Venezuala in Caracas and he returned to Brisbane to conduct THE QUEENSLAND ORCHESTRA on its northern regional tour, an engagement he repeated during 2009. 2009 also included a return to the TASMANIAN SYMPHONY ORCHESTRA. During 2010 Marco Zuccarini made his debut with the CHRISTCHURCH SYMPHONY ORCHESTRA performances of which THE PRESS wrote of his conducting of Rachmaninov’s PIANO CONCERTO NO.3, Conductor, Marco Zuccarini brought order to this rather unruly work with great skill… this was a performance of real distinction., and of Brahms SYMPHONY NO.4, Zuccarini gave a wonderfully clear and uncomplicated account… This is a conductor I would very much like to have back. In 2011 and 2012 he made three visits to conduct the QUEENSLAND SYMPHONY ORCHESTRA, performances which included SYMPHONY UNDER THE STARS in the program of the BRISBANE FESTIVAL and a gala concert of scenes from all seven Puccini operas. He returned to conduct the same event in the BRISBANE FESTIVAL during 2013. More recently his recording of the Wolf-Ferrari VIOLIN CONCERTO with the FERRARA SYMPHONY ORCHESTRA and soloist, Laura Marzadori, also Concert Master of the ORCHESTRA OF LA SCALA MILAN, was released on the TACTUS label in 2014. The same label will release his recording of Sinidallia’s VIOLIN CONCERTO and ROMANCE & HUMORESQUE and REGENLIED, during 2018. His 2018 appearances included a concert with legendary Argentinian pianist, Martha Argerich, at the PORTO CERVO FESTIVAL in Sardinia.